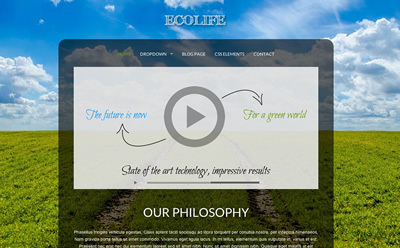 Ecolife is a responsive WordPress theme that can be used for non-profits, ngo’s and any kind of business website. It comes with a full background slideshow that fits any screen size while keeping the image ratio. In the front page you can embed a video from YouTube that is integrated with a lightbox display. In the theme we have included also a custom widget with integrated tooltip that is created specifically for this theme to enable you to create a list of your team members easily and in attractive way. Featured video in the front page. Custom widget to display team members with integrated tooltip.